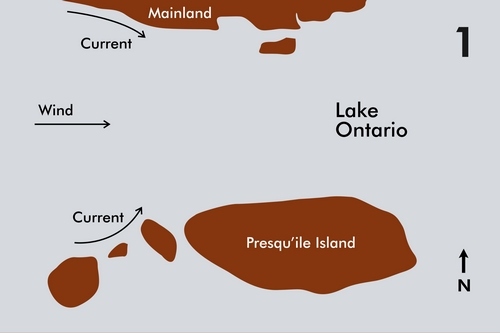 Presqu'ile's origin goes back 450 million years to the middle Ordovician period. At that time a warm, shallow sea covered this part of North America. At the bottom of this sea, limey sediment and shell fragments from the sea's inhabitants slowly accumulated. Southern Ontario was covered by this sea for almost 150 million years and, by the time the water was gone 300 million years ago, the sediments at the bottom of the sea had been squeezed and turned into a package of sedimentary rock at least five kilometres thick. Many of the sea creature's shells had been transformed into fossils in this rock. In the millions of years since the sea disappeared, this package of rocks had been eroding away. For the last two million years, the time of tropical seas had long passed and this part of North America had been subjected to a series of ice ages, with kilometre-thick ice sheets scouring the land and further eroding away the rocks. When the last ice sheet melted about 12,000 years ago, it left behind vast quantities of sand, gravel, and boulders that it had scoured from the land beneath it. It also left behind a lot of water which filled the low areas of the land forming the proto-Great Lakes, much like the Great Lakes we see today but even bigger. These lakes are often referred to as 'glacial lakes'. The glacial lake at Presqu'ile has been called Glacial Lake Iroquois and its former shoreline is now marked by a long, gentle escarpment or, in other places, a low ridge of old beach deposits that parallels today's Lake Ontario shoreline. This is the hill that can be seen to the north of Presqu'ile when you stand on the beach today. Many of the roads north of County Road 2 just west of Brighton take you up this old beach escarpment and provide a spectacular view of Presqu'ile in the lake below. Take a drive up Fiddick, Trenear or Jackson Roads and see for yourself. In the last few thousand years Lake Iroquois drained somewhat to form our present-day Lake Ontario. As it did so, five islands appeared off-shore of the mainland. These islands are comprised of limestone, part of that package of rocks formed so long ago in the Ordovician. This limestone has now been designated as part of the Lindsay Formation and is described as thin, crystalline to nodular limestone with very thin shaley seams (Peterson, 1969). This means that the rocks break up quite easily and form the low rubble cliffs found today on the south shore of Presqu'ile. This also means that the rock is not very suitable for building stone as demonstrated by the fate of the Presqu'ile Lighthouse (see the History section here). This rock is full of fossils, primarily crinoids, brachiopods, trilobites, and cephalopods, in decreasing order of abundance. Most of these fossils are fragments of the animals' shells, as they probably tumbled down a slope on the sea bed before coming to their final resting place to begin the process of fossilization. Examples of these fossils can be found along any of the Park's shorelines where rock is exposed. Good fossil hunting can be found at Chatterson Point, behind the Nature Centre and by the Lighthouse. You can take fossils you find to the Nature Centre for display. It is just in the last 10,000 years that the elements conspired to form the Presqu'ile we know today. Presqu'ile Provincial Park includes the Presqu'ile Peninsula as well as Gull and High Bluff Islands. The mainland portion of the park is a feature known as a tombolo, which is a peninsula formed as the result of sand deposition between the mainland and a former island. The Presqu'ile tombolo is a fascinating formation, unequaled in size, complexity, and degree of development on the Great Lakes. Three of the five islands that rose above the surface of the lake, High Bluff, Gull Island and Sebastopol Islands, are still separated from the mainland. The other two islands have since become attached to the mainland to form the tombolo. One small former island now forms the area around Owen Point. 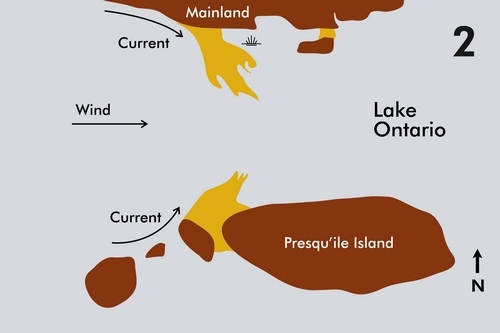 The much larger former Presqu'ile Island now makes up most of the southern part of the Presqu'ile Peninsula. Limestone bedrock is very near the surface on the present and former islands, except in a few places where sand deposits remain from times of higher lake levels. Bedrock exposures occur around the shorelines as flat ledges extending into the water and as small bluffs. 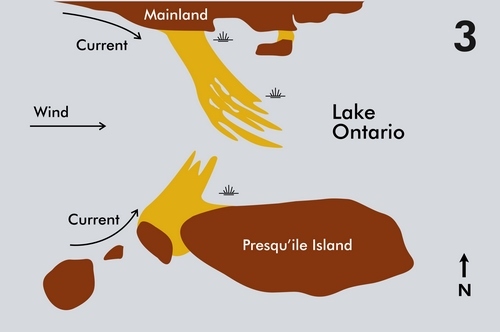 The Presqu'ile tombolo formed as waves coming from the west and southwest brought sand and gravel, which glaciers had deposited in the Lake Ontario basin, closer inshore. 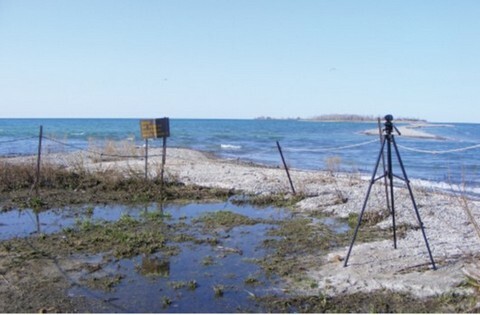 The sand and gravel were then deposited in the shallow waters of Presqu'ile Bay. As the deposits deepened, sand spits formed on the mainland and on the former Presqu'ile Island. Early sand spits from the mainland formed The Fingers. Eventually a northern spit grew across the intervening channel and became joined to the much smaller island spit. 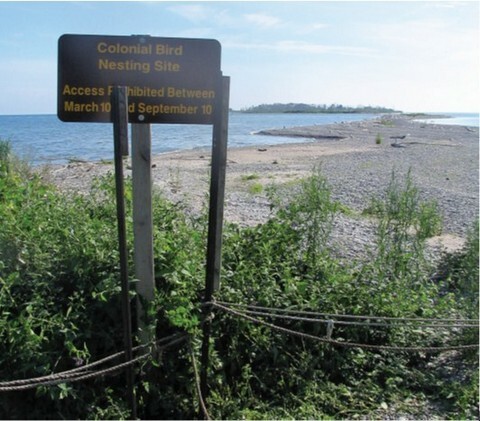 Once the two spits had joined, creating the tombolo, sand which had formerly moved eastward into Presqu'ile Bay became trapped to the west of the tombolo and a beach began to grow westward. The process of sand deposition continues today, at a remarkably rapid rate. Air photos suggest that the beach deposits grew an average of more than two metres a year between 1949 and 1986. Extrapolating these rates back through time, the relatively young age of the sand connection to the mainland is evident. The entire area west of the main park access road, for example, has been deposited since the early 1800s. Under natural conditions pannes and dunes slowly fill in to forest and the continuous deposition of sand results in the creation of new panne, dune, and beach habitats. Raking of the beach to enhance its attractiveness to swimmers has modified the natural processes, preventing foredune formation and succession of plant communities and leaving an unnaturally wide stretch of bare sand making up the present beach. Today the tombolo remains a dynamic formation subject to the whims of the wind and waves. It is most noticeable at Owen Point. It grows and shrinks continually and since 2006 Gull Island has been attached twice to the Point only to be broken apart again. Even the difference of a few months can be dramatic as these 2008 photos show. This is May 2008 and this is July 2008. Only time will tell what the water may give or take away. Peterson, N.N. (1969). Carbonate Petrology, Structure and Stratigraphy of the Middle Ordovician Carbonate Rocks in the vicinity of Kingston, Ontario. Unpublished Ph.D. Thesis, Queen's University, Kingston.